MINI unveiled a very different concept car at the Geneva Motor Show - the Clubvan. A van-version of the MINI Clubman, the concept is very likely to go into production and we could see it on the roads by the end of 2012. To turn the Clubman into a van, MINI has stripped out the back seats and created a flat load area which gors from the split rear doors up to a partition grille behind the front seats. There are six hooks loops in the load floor that use straps to keep cargo in place while the side walls, floor and roof lining are finished in antracite coloured cloth. There aren't any details about the maximum load capacity of the Clubvan but it's expected to be notably more than the 930 litres in the Clubman. The concept comes with the extra side door like the Clubman, but now it's crucially been changed to the right-hand side so that you can load and unload onto the pavement. The interior can also be customised with made to measure drawers for tools or shelving units. The Clubvan Concept comes in British Racing Green including the roof, rear pillars and mirror caps. The rear side windows are opaque with polycarbonate sections and are painted in the car’s body colour while the rear twin doors have heavily tinted glass making it difficult to see in. 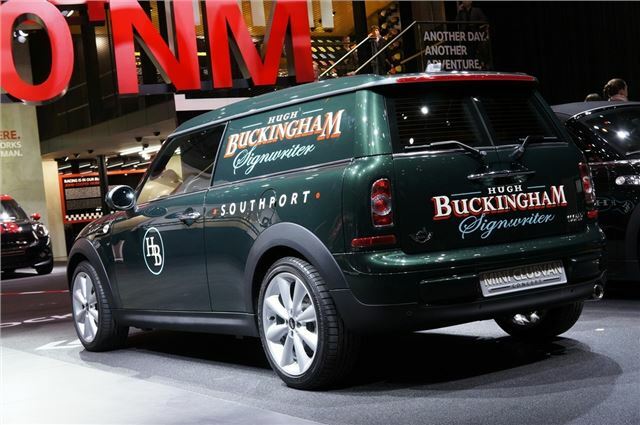 To give an idea of what a branded van will look like, MINI has mocked up the concept car with a UK based company - ‘Hugh Buckingham Signwriter’ - which is based in Southport and creates similar vehicle graphics for its customers.